It should be a relatively simple matter to buy Mugs, Pottery, China and Glass Ware made in the UK. British pottery is the best in the world and some of the industry still survives today. That said you’ll have to shop around, use the internet, and look carefully at back stamps for the words ‘Made in England’ or similar as a lot of pottery for sale on the high street these days is foreign made. 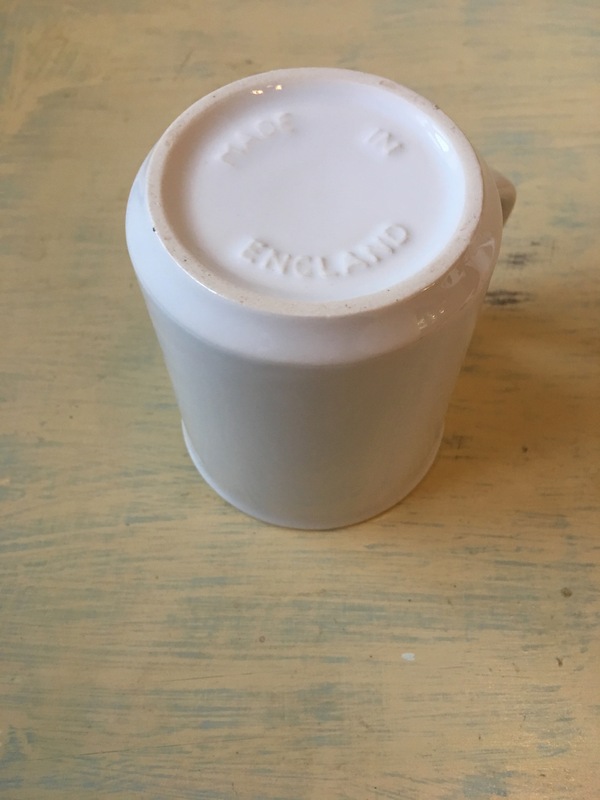 The base of a mug with the words “Made in England” on it. Photograph by author. Look for the words “Made in England” on the base of pottery and glassware when buying. This entry was posted in china and glass, Mugs, Porcelain, Pottery, Tableware and tagged Andrew Pentland Ceramics, Anita Harris Art Pottery, Aston Pottery, Aynsley, Bairstow Manor Pottery, Bairstow Pottery Collectables, BB-Plastics, BBP, Bell Tent UK, Berserks Glassworks, Beyond the Fridge, Big Tomato Company, Bilston Enamels, Bottle Sport, Branded mugs, Brierley Hill Crystal, Bristol Blue Glass, British made enamel mug, British Made Mugs, British made Pottery, British Mugs, British Pottery, Burleigh Pottery, Burslem Pottery, Caithness Glass, Carlton Ware, Carters of Suffolk, Cauldon Ceramics, Caverswall China, Character Shop, Chart Lane Enamels, china and glass, Churchill China, Claypigs, Click for Art, Costa, Crockery, Dartington Crystal, Dartington Pottery, Denby, Dimbleby Ceramics, Doidy Cup, Dorisware, Duchess China, Dudson, Dunoon, Dunoon Mugs, Elliot Hall, Emma Bailey Ceramics, Emma Bridgewater, Fenella Smith, Finsbury, Fortnum and Mason, Francis and Jellyman, Gluggle Ltd, Grayshott Pottery, Guy Martin Proper, Halcyon Days, Harrods, Harrow and Penny, Hartley Greens, Heron Cross Pottery, Higgs & Crick, House of Hackney, House of Marbles, Hudson and Middleton, Huhtamaki, Jody Leach, KeepCup, Kentmere Pottery, Kevin Francis Ceramics, Knockando Mill, Lifeventure, Linda Bloomfield, Lise B Moorcroft, London Cloth Company, Luckenbooth, Made in England, Made in Wales, Manor Pottery, Melamine, Mintons, Moorcroft, Moorland Pottery, Moss Bikes, Mug For Life, Mugs, My Moustache Cup, Nakd, Natural History Museum, Ohyo, P & J Ceramics, P&J Ceramics Ltd, Peggy Davies Ceramics, Peregrine Pottery, Perin Towlson Ceramics, Peter and Marie Graves, Pimpernal, Plastic mugs, Plastic plates, Plowden & Thompson, Poole Pottery, Portmeirion, Promotional mugs, Repeat Repeat, Roy Kirkham, Royal Albert, Royal Brierley Crystal, Royal Crown Derby, Royal Doulton, Royal Stafford, Royal Winton, Royal Worcester, Salmon Luke, Seakisses, Souvenir mugs, Spode, Staffordshire Crystal, Staffordshire Enamels, Steelite, Steelite International, Stoke Art Pottery, Stoke-on-Trent, Studio Bisque, Surrey Ceramics, Susan Rose, Tableware, Tain Pottery, Teign Valley Glass, The Old Sun Pottery, The Potteries, This is a Limited Edition, Thomas Birnie, Tomato Catshop, Trickett, Trickett England, Tutbury Crystal, UK Made, ukmade, Unite and Type, USE, Victoria Armstrong, Wade Ceramics, Waterford Crystal, Wedgewood, Weston Mill Pottery, William Edwards, Woburn Pottery, WWRD, Yas-Ming Ceramics on September 26, 2012 by ukmade.